For the third consecutive season the European Handball Federation gives fans the opportunity to vote for their Women’s EHF Champions League All-star team. Last season more than 22,000 fans participated in the vote and following this huge success, the EHF has once again nominated 50 players and coaches as a preliminary all-star selection. Voting will start on 5 April at 12:00 hrs and closes on Tuesday, 3 May 2016 at midnight. Fans can choose their team online. Fans have the chance not only to vote for the best player in each position and the best defender – there will be five nominees each –, but also for the best young player (born in 1993 or younger) and the best coach. These players represent 17 different nations and 12 clubs from the current Women’s EHF Champions League season. The fans’ choice for the All-star team will be announced during the Women's EHF FINAL4 in Budapest on 7/8 May 2016. 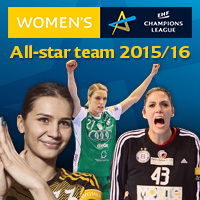 Enter the vote of the 2015/16 Women's EHF Champions League All-star team here.